For what man in his right mind would want a witch for a wife? I seemed to be on the end of a bandwagon of people who read this anticipated debut. I read reviews that absolutely loved it and those that were pretty disappointed. I think I fall somewhere in the middle. As a debut, I was incredibly impressed with Hester Fox. I’m keeping my eye on her and I’m definitely going to read what she comes out with next. But, it certainly wasn’t perfect. It suffered a bit with its premise. I feel like Fox could have taken the witch-y elements so much further than she did. Even the book synopsis sort of insinuates a little more than what actually happens. I wouldn’t call this a book about magic (although to say there is NO magic would be insincere). To me it felt like a haunted version of Sense & Sensibility. Let’s start with the beginning – three sisters, used to the bigger city, move to the countryside. While out for a walk, one is caught in the rain, hurts herself & is rescued by a handsome eligible bachelor who also happens to be wandering around in the middle of a downpour… sound familiar? Of course, in the case, John Barrett is lovely (unlike a certain Willoughby). To be fair, the book does do it’s own thing but I believe Fox was channeling a bit of Jane Austen through the whole thing – which isn’t necessarily a bad thing. The Montrose family is well rounded and each of them have their own fears, passions and faults. Sisterly fighting, romance, suspense, tons of intrigue & ghosts galore. The ending also may have been the best part of the whole novel. But I feel like I have to mention (as a mother!) that the Montrose girls’ mother really got the short end of the stick in this one. I won’t say more because #spoilers but let’s just say it seems like nothing good happens to that poor woman. It is a pretty quick read. I think it is perfect for October 🙂 Hope you like it!! 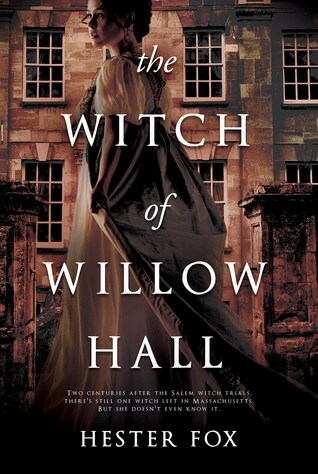 Haunted Sense and Sensibility… color me intrigued enough to give this one a try! Great review, Becky! Thank you lovely ❤ I couldn't get S&S out of my head for the first third of the book. LOL. Now I want to go back and watch the movie! I always want to go back and watch S&S. And then I digress into an Austen marathon. every. single. time. Have you seen Austenland? It is one of my favorite movies ever. If there are people alive who haven’t seen and loved Austenland they are monsters. I am basically Keri Russell. Great review. Im not sure if I’ll pick it up, but it’s intriguing book. Sounds really interesting. Great review! I’d seen the cover before, but hadn’t read more about it — now I want to check it out! It just came out yesterday. Maybe check the library?? 🙂 Hope you like it if you get to it! I may still read this one but won’t necessarily bump it up the list! Thanks for the review! I’m never going to say no to more magic! Is a sequel expected or was this a standalone? It was a standalone. The ending was completely wrapped up BUT it would be soooo easy to continue the story. So, we’ll see… doesn’t look like the author has any firmed up plans for her second book. Lots of standalone seem to become duology’s, so you never know! Great review, and a haunted version of Sense and Sensibility sounds about right!